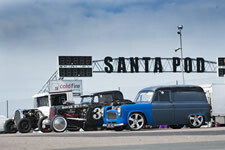 Organised by the NSRA and Santa Pod Raceway, a hot rod meet rolled up into a weekend of nostalgia style drag racing. Run what ya brung for pre-1973 cars. 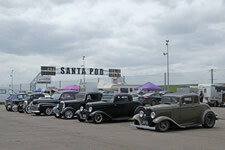 Hot rods, customs, Outlaw Anglias, dragsters, altered and the Gasser Circus. 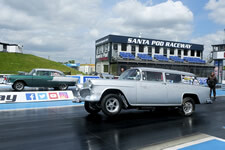 NSRA Nostalgia Nationals 2018, Santa Pod Raceway. Scott Collin, 1928 Model A pickup, 24 runs. Joel Kerr, Pontiac Starchief, 8.1663 seconds @ 171.08 mph. Ken and Bradley Cooper, Flathead Slingshot, 11.39 seconds @ 116 mph. Bob Hawkins, ‘Time Traveller ll’ slingshot, 7.861 seconds @ 211mph. Joel Kerr, Pontiac Starchief, 7.866 seconds @ 177 mph. View photos from Nostalgia Nationals 2018 on the Facebook Photo Gallery.